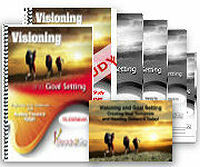 Workshop: Visioning and Goal Setting - Projecting Your Tomorrow and Heading Toward It Today from Ready2Go Marketing Solutions, Inc.
To see a sample of the workshop, click here. What we all must understand is that our level of success is in direct proportion to what we actually get ourselves to do - what we actually act upon, believe in, are passionate about, and willing to follow through on. Extensive research by several prestigious universities points to the same conclusion: every person who accomplishes a great deal, and performs at optimum levels, does so by having a clear vision and goal of what they want. Having a clear vision and goal is the hallmark of high achievement. Dreams, goals, and your own innate potential are useless without having the ability to follow through on them. So, what clear vision do you have for your future, or are your hopes merely a dream? To achieve anything, you first have to see what you want. To do so you must create your own personal vision. 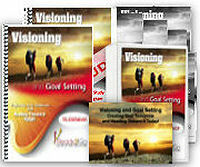 Visioning and goal setting is a combination of using the mind and body, mental and physical, thoughts and actions. In our Vision Setting workshop, you will tap into your imagination and create a future vision of what you want for your life. Then, once you have this vision - this mental image of your future – you can plan out the short-term steps needed to reach it. You will also create focus and eliminate the distractions that keep you stagnant. With your vision alive at the forefront of your mind and heart, you will stay centered on the right road that will lead to your specific destination. As Robert Frost has so perfectly captured in his famous poem, "The Road Less Traveled," this can truly make all the difference for you. This 4 hour workshop has 11 interactive exercises/activities and is a perfect addition to the other Visioning and Goal Setting – Projecting Your Tomorrow and Heading Toward it Today products. The information in this three hour workshop compliments, but does not duplicate the products in the other suite. This component begins the workshop by preparing the participants for learning. It relates directly to the topic, and at the same time it grabs the participant’s attention. —"Why? Because…" where participants will write and respond to questions surrounding the idea of vision and goal setting. The questions and answers reflect underlying principles and assumptions surrounding visioning and goal setting. —"Tic-Tac-Oh!" where participants will explore the challenges and distractions that often affect the accomplishing of objectives. This is our starting point where we will take some time to be introspective and reflect on the, "the components of my life now" at this moment in my life. We'll take an honest look at our history as well as the current constraints we face in the real world. We'll also look at what desires seem to be calling us, ever pressing us forward toward a more fulfilling life. —"Getting Centered" where participants will perform a quick centering exercise as an opportunity to detach from the distraction, worries, or concerns of the day and become fully present for the remainder of the workshop. —"Discover Phase" where participants will assess their current lives, inventorying and reflecting on where they now stand. Next, we’ll move on to the dream portion where we can lose ourselves from our real-time constraints and just imagine, "what might be." We’ll look at the ideal life we want to envision, the changes we want to experience, and put our dreams to paper. It is here that we will awaken what’s possible for us at a determined point in the future. —"Dream Phase" where participants will create a powerful vision of what their ideal life would look like. Finally, we'll look at what it will take for us to reach the future we have awakened for ourselves. Now that we have been empowered, what realistic strategy or process can we put in place that will lead to the success we want? It is here that we will provide clarity around "making it happen." This is where we plot our tasks, consider the support that will be needed from others, and be aware of the challenges that will certainly test us. It is here also that we embrace intentional living, and know that the action plans we create will move us even more quickly in the direction of our dreams. —"Vague, Frustrating Objectives" where participants realize the importance of avoiding ineffective goals that accomplish little in moving us forward toward our dreams. —"Manageable, Measurable Objectives" where participants realize the importance of specifying clear and simple goals that will drive our visions to manageable, measurable objectives and action plans. —"Do Phase" where participants will develop a strategy to get from where they are now to where they want to be in the vision they have for their futures. —"Cocktail Party" where participants practice sharing their visions with others. They also engage in summarizing the key discoveries they made from the three different phases of the visioning process. 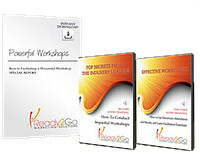 This part of the workshop is the culmination - the fulfillment - of all the learning that has gone on during the workshop. —"Remaining Accountable" where participants listen to a mini-lecture on the need to remain accountable to their visions and to reframe how they see failure. —"24/10/7" where learners commit to using and referring to the visions they have created during the workshop when they returned to their real-world lives.